A crowd was gathered at a tavern on Long Lake for the annual UFO Daze festival hosted by local UFO researcher Bill Benson on the evening of July 17, 2004. UFO enthusiasts have been gathering here by the hundreds to share their experiences and hoping to spot something strange in the sky since 1988. But this particular night would be different. When the hot and humid summer day gave way to night, many of the day’s visitors still remained to see if anything unusual would show up in the night sky. It was near midnight when excited murmurings from the crowd turned all eyes to the sky. The object passed low and silent over the crowd with a Y-shaped pattern of lights, and disappeared over the tree line. Whatever it was the crowd at UFO Daze witnessed that night, it was not an isolated incident. Mysterious orbs of flashing lights and strange objects in the sky are not uncommon in the area, and have turned more than a few skeptics into believers. There is a long history of unexplained sightings over Long Lake and Dundee Mountain, and Bill Benson is eager to share it with anyone who asks. 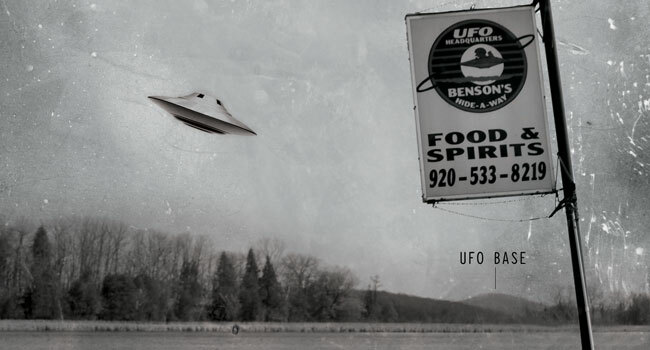 Bill’s extraterrestrial-themed tavern, Benson’s Hide-a-Way, is likely the only place in Wisconsin where you can report a UFO sighting, see an alien in a jar, and get a killer fish fry on a Friday night. Alien posters, UFO models, tinfoil hats, and inflatable little green men adorn the interior. There is a scrapbook at the bar full of unidentified flying objects photographed in the area by Bill’s friend Tim Hildebrandt, who spent many nights with his cameras on the summit of Dundee Mountain capturing those images. 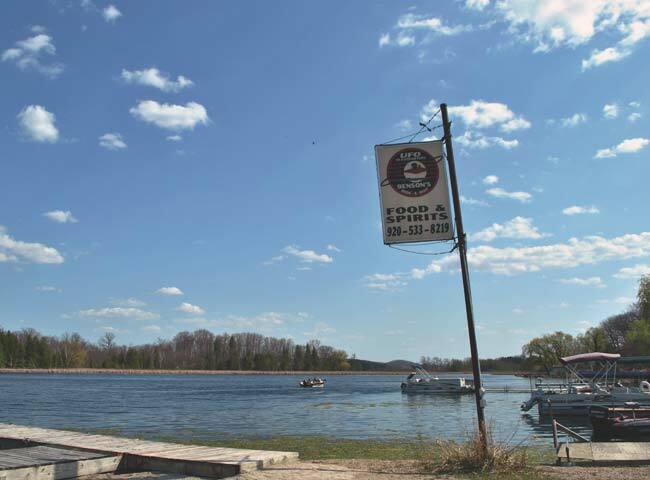 Benson’s is located in the heart of the picturesque Kettle Moraine State Forest, an area known for hiking, camping, and fishing. It seems an unlikely setting for flying saucers and alien abductions. Nevertheless, decades of strange happenings have lead locals to proclaim it the UFO capital of Wisconsin. Visitors come from around the globe to get a glimpse of something otherworldly hovering over the rural community, and they congregate at the Hide-a-Way. Bill’s unusual interest began in the late 1940s, he said in a recent interview. When he was a child, crop circles appeared in an oat field about four miles from his home. The farm was owned by relatives of Bill’s in an area near Dundee known as the jersey flats. Later, during his time serving in the US military in Vietnam, he personally witnessed a large bright light moving unnaturally in the distant sky while on guard duty one night. “I saw a strange orange light dancing off in right angles, flashing quickly, twisting and moving around rapidly,” he told the Fond du Lac reporter in 1993. But for Bill, the seminal moment came in 1985 when a circular object hovering near his neighbor’s farm on Vista Drive kept frightening the cows out of the pasture and into the barn. Another neighbor witnessed the event from his car while driving down the road. This incident prompted Benson, along with his friend and radio personality Robert “UFO Bob” Kuehn, who maintained ongoing telepathic communication with an alien named Eveata from the Plaidian star system, to hold the first UFO Daze as a safe place for others who had similar experiences to share their stories. 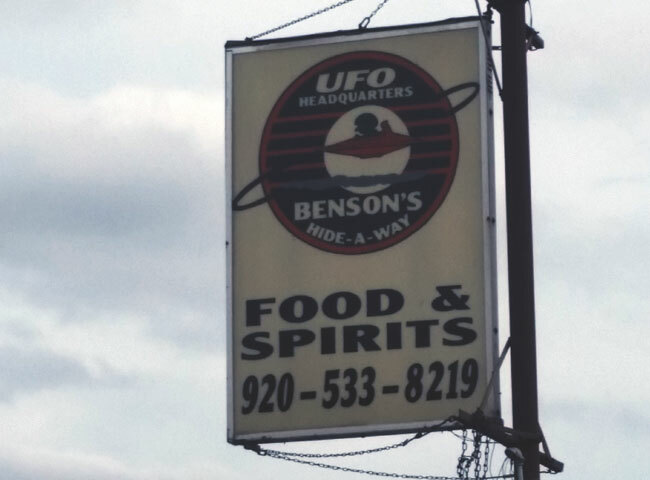 30 years later, UFO Daze is still a popular yearly event, and Benson’s enthusiasm for the subject matter is known worldwide. Dundee Mountain looms high above the tree line at the southern end of the lake. Gouged from the earth by the last glaciers to tear through the area, the “mountain” is actually a 270-foot high moulin kame formation made up of sediment left behind by the glaciers when they retreated over 10,000 years ago. And, depending on who you ask, it may be the source of the area’s mysterious activity. Long before the modern sightings around Dundee Mountain, it seems Native Americans were well aware of it’s unusual properties. But what exactly does the ominous mound of dirt have to do with the unusual occurrences in the area? Bill doesn’t pretend to have the answers. He has no idea why Dundee is the center of so much strange activity. But he does seem to believe Dundee Mountain may be the source of it. “Something is under there,” he told a reporter in 2016. What it is, not even Bill knows. 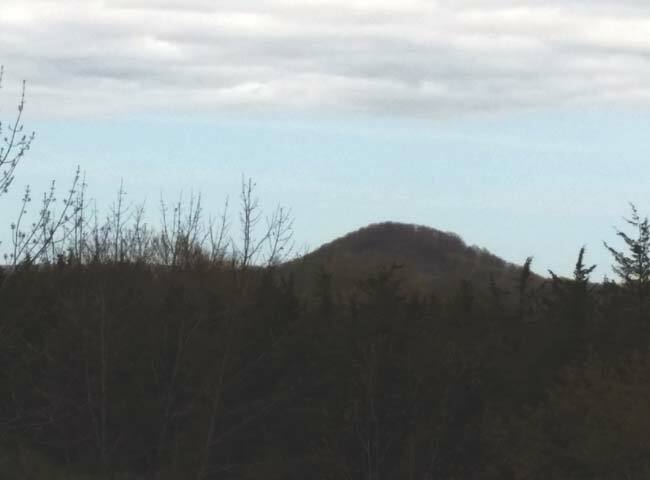 1998: Bill Benson and 5 others witness a large orange ball hovering over Dundee Mountain. It vanishes when 4 fighter jets suddenly fly in after it. Have you experienced anything strange in the Kettle Moraine or around Dundee Mountain? Share your story in the comments below or contact us. Past summer 2018…witnessed an object being chased by a helicopter at high speed toward Dundee area. Object too large to be a drone.